Buy More Poly Curling Ribbon Colors Save More! 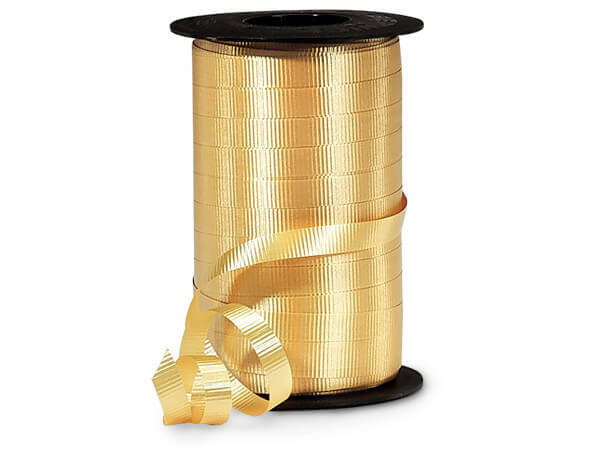 3/8" Gold Curling Ribbon - Made in the USA of 100% Polypropylene. Safe for use with helium-balloons. Meets FDA requirements for direct food contact at normal conditions. Berwick Curling Ribbon for Christmas gift wrapping, balloons & bows. Beautiful colors at wholesale in 3/16" x 100 yard & 3/8 x 250 yard bulk spools! Made in the USA from 100% polypropylene ribbon.